A stick fight to the sound of a throbbing drum, and broken beads streaming across the floor. This is the start of an epic tale that takes place in Eqhudeni. Eqhudeni, the place of the rooster, is a village in Nkandla. In this historic fiction directed by Nomfundo Magwaza and Ntando Ngcungama, Eqhudeni is a place where dawn never breaks. 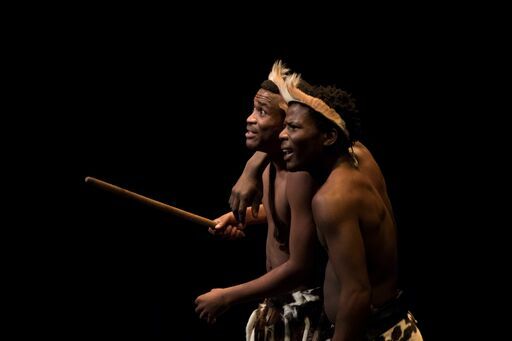 The winning play of the Zwakala Festival, Eqhudeni is set in an era when the rules of the presiding Zulu culture reign. It is in the complexities of this particular patriarchal system that the narrative takes place, with its many twists and turns that awfully end with death. Like a Greek tragic trilogy, the final death foretells of continued tragedy for a good family. The Ndlovu family’s rollercoaster begins with the father, and head of the household, losing all his cattle as punishment for injuring a man in the man’s own yard. Forced into a corner by his wife who issues an ultimatum that he marry off the eldest daughter or lose his family, the patriarch agrees to a marriage between his daughter and a wealthy suitor. So begins the tally of bad decisions from people pushed into similar either-or situations. This Zulu epic is told in heightened language. Idioms and aphorisms of old are revived to reveal the reasons forcing every life touched by the story to unfold toward its own tragedy. The historification of the plot not only allows us to see how we allow ourselves to be governed by unquestioned ideas but also affords a rich use of the Zulu language that is often sheer poetry. “I’ve been to festivals and ngihlezi ngibona amashows amanje,” says Nomfundo Magwaza. She says she was interested in thinking about how things operated during the time of her maternal ancestors. And, indirectly, she ends up creating a strong feminist critique of how the given conceptions of the roles of men and womxn are predetermined towards tragedy. The play’s use of aphorisms like ‘ubuhle bendoda zinkomo zayo’ is put in contrast with the events that take place. It is sung as a celebration, ‘the attraction of a man is his cattle’. The audience sings along as the play is delivered in a participatory fashion that charges the entire auditorium. Then, when the father asks his wife to consider his desire for his daughters to be happy in marriage rather than to marry them to the man with the most cows, he is confronted by the wife’s own patriarchy in commanding him to be a man and provide for his family through the marriage-acquisition of cows. This theme is revisited again when the wealthy suitor, having been left at the altar, delivers a monologue about being caught between love and wealth. He has to decide whether or not to recall his cattle from the Ndlovu family. At every turn, it is the sayings that pertain to maintaining patriarchal positions of power that prompt the next tragedy. The men struggle within the roles expected of them. They posture when they are in front of one another, and express different desires to the actions they perform when they are in private with their female lovers. What also determines the feminism of this epic narrative, is the role of the womxn as each other’s heroes. It is not a naïve reflection of all womxn as heroes. The mother is far more patriarchal than the father and she constantly forces him into a corner. The daughter, who is the younger sister of the eldest who is to be married off, is clear about the life she wants for herself, and pursues it. She plots her older sister’s escape from the unwanted marriage, and ultimately, she suffers the tragedy at the peak of the play. In an imaginative use of the beauty of Zulu traditional dress and the meaning imbued into each item of clothing, the daughters are given a set of head-beads by their mother. A redeeming moment in a play in which no character is merely good or bad. The gift is not only a mother’s love but a symbol of the initiation of the daughters into womxnhood. Metaphorically, the beads represent the young womxn’s virginity as she is readied to be able to share it with her husband. In the play, both sets of beads are removed by men who are not the daughters’ husbands. One chooses to share her beads with the man she loves. The other has her beads ripped off her head and scattered on the floor in a mirror moment to the scattering of beads that begin the piece. The tragedy is that the events of horror occur because of performances of patriarchal power. It is this that makes Eqhudeni a significant political play in the community theatre tradition. The actions are all experienced through a celebration of culture and a simultaneous critique of unquestioned patriarchy passed on within phrases repeated by rote. When the mother tells her eldest daughter to accept the unwanted marriage, she repeats a phrase that comes from a time when marriage was arranged and not chosen. She tells her daughter that love arrives later in marriage. She essentially tells her daughter to grin and bear it. It is a cliché of unhappiness and this is the tragedy. The events that take place Eqhudeni are not new. They continue to happen in contemporary society and in the Zulu culture today. They mar the beautiful freedom of the culture where, as in the play, men and womxn walk around barefoot and bare-chested. They are open to each other as bodies sharing an equal space in different decoration. It is when options for recourse are limited to an either-or binary that tragedy strikes. Eqhudeni is where the chickens come home to roost, with punishment greater than the crime. Eqhudeni was declared the winner of the Zwakala Festival. The Critter’s coverage of the festival was sponsored by The Market Theatre Foundation.